John Kim is Senior Research Engineer at CTS Cement Manufacturing Corp. in Cypress, Calif. He holds bachelor’s and master’s degrees in Materials Science and Engineering from the University of California, Los Angeles, along with an EDP Certificate from the Wharton School of Business. He has more than eight years of experience in materials science, product development, research, cement chemistry, pavement design and business development. Portland cement concrete is, perhaps, the most ubiquitous building material in the world. This technology has stood the test of time and it is still a mainstay in our modern-day infrastructure. However, while its success as a material cannot be undermined, there has been limited innovation and improvement with the product since its discovery by the Aspdin family in the 1800s. If the task of improving portland cement were undertaken, each industry and individual would probably come up with different attributes tailored to their specific needs. If the overall improvement of portland cement were to happen, six specific attributes must be considered: speed, strength, shrinkage, sustainability, silica reaction, and sulfate resistance. A material or system that embodies all six of the characteristics would be considered a six sigma concrete. Some or perhaps all of the qualifications of six sigma concrete can be achieved with a combination of chemical admixtures and or supplementary cementitious materials. However, one interesting solution that embodies all six characteristics is belitic calcium sulfoaluminate (BCSA) cement. This innovative powder was developed in the 1970s, following the discovery of the calcium sulfoaluminate (CSA) compound in the 1950s by University of California, Berkeley Professor Alexander Klein. The primary constituents of BCSA cement are belite, a portland cement compound, and CSA. It is a standalone cement that is most often characterized by its extraordinary rapid strength development capabilities. The trademarked Rapid Set product, manufactured by CTS Cement, is chemically a BCSA cement. In any portland cement concrete application, there is always this inevitable bottleneck: curing time. If the strength gain of the concrete could be quickened, it would result in a much more efficient material. In portland cement, alite is the chemical compound that is primarily responsible for the onset of early strength. The more alite you have, the higher the early strength of the cement. For example, ASTM C150 Type III product has the highest concentration of alite among the portland cement family. The problem with alite is that it takes a few days to begin hydrating and to develop adequate strength. In BCSA cement, there is no alite at all because it has been completely replaced with the CSA compound, which hydrates very quickly, and exhibits a chemical process practically completed in 24 hours. Essentially, BCSA cement is capable of producing structural strength within one hour, while a 28-day portland cement-grade strength is often attained within one day. 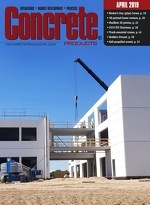 Strength, especially long-term strength, is a critical component in concrete durability. In portland cement, the chemical compound responsible for late age strength is belite. It hydrates significantly slower than alite, but continues contributing to strength development for many years. The more belite you have, the higher ultimate strength you will achieve with the concrete. BCSA cement has a significant amount of belite—about 45 percent by weight. This belite content is much higher than in Type I or Type II portland cements, which are the most commonly used among the ASTM C150 products. The combination of the high belite content along with the strength that comes from the hydration of CSA produces a highly durable material, capable of achieving long service life. Shrinkage has long been the bane of portland cement concrete. The use of control joints has somewhat mitigated the effects of shrinkage, but uncontrolled cracking still remains a big issue. From a cement chemistry perspective, there is one primary reason why portland cement concrete shrinks. Both alite and belite hydrate in order to form calcium silicate hydrate (CSH). CSH gel is a metastable product that will shrink over time as the water leaves the system. BCSA cement has about half of the silicates as found in portland cement; such reduction drastically lowers the potential for drying shrinkage. Also, the hydration of CSA is very water dependent. With no excess water of convenience, a BCSA concrete will almost never have bleed water that rises to the concrete surface. All things considered, BCSA cement exhibits about half or a third of the shrinkage found in portland cement. It is estimated that portland cement production worldwide contributes to about 5-10 percent of the anthropogenic carbon emissions. The production of BCSA cement is estimated to emit 25-35 percent lower carbon emissions when compared to the production of portland cement. There are two main reasons for this reduction. One, the cement mix design requires less limestone. The calcination of limestone is the primary contributor of CO2 emissions, and so less limestone results in a lower carbon factor. Second, the production of BCSA cement requires lower burning temperatures (about 200° C). The lower combustion temperature requirements come from the absence of alite, which requires higher burning temperatures. With portland cement netting about one ton of carbon dioxide per ton of finished product, the use of BCSA cement addresses some of the environmental concerns often associated with cement production and is a much more sustainable product. Alkali silica reaction represents a severe form of concrete deterioration. This topic has been a hot issue more recently, and more government entities are requiring ASR testing in concrete specifications. Unfortunately, the fundamental mechanisms of ASR are not very well understood. There are a few industry standard tests that have been helpful, but even they do not always perfectly predict ASR behavior. However, the use of BCSA cement has shown better mitigation than portland cement. This is likely due to a combination of lower alkalis, lower pH, and reduced porosity in BCSA cement, but it has yet to be confirmed. Still, the use of BCSA cement in confronting the problem of ASR is quite promising. It has been well documented that sulfate resistance is directly tied to the amount of celite in the cement. Each type of portland cement has varying levels of celite, and the less you have, the more sulfate resistant the cement. For example, Type V is the most sulfate resistant portland cement in the ASTM C150 family, and it typically has 4-5 percent celite. In BCSA cement there are no detectible amounts of celite, and therefore it exhibits the greatest sulfate resistance, even better than Type V portland cement. This fact has long been established in academia as well as in the field. Belitic calcium sulfoaluminate cement is an innovative solution to many of the shortcomings of traditional portland cement. While it may not be the only solution, BCSA cement is definitely capable of producing a six sigma concrete. Since the 1970s, BCSA cement has a proven track record of success. It is used worldwide by airport and department of transportation officials to achieve high quality, long lasting concrete results. Alite or tricalcium silicate is responsible for early strength and begins hydrating at around 24 hours. Belite or dicalcium silicate imparts late age strength and begins hydrating much later than alite for an extended, indefinite period. Hydrating alite and belite form CSH or calcium silicate hydrate gel, prone to shrinkage due its dimensionally unstable characteristics. Celite or tricalcium aluminate reacts with sulfates and causes undesirable sulfate attack in concrete. CSA or calcium sulfoaluminate hydrates immediately and is practically complete within 24 hours, hence its early strength and rapid hardening properties.